Apple’s iOS 7 made a grand entry with the public installing the software as quickly as possible. Soon after its release, iOS 7.0.1 followed and now iOS 7.0.2 has also joined the league. The update is really small, hardly taking a few minutes to download. And yes, it does fix the major iOS 7 problem about cracks in security. In addition to this, iOS 7.0.2 has bought back the Greek keypad. The iOS 7 has not been held accountable for any major fault like iOS 6’s maps blunder but it is still under scrutiny due to the security issue. The new-lock screen’s lapse of security has been a constant source of complaints all over the media. And for the eradication of this very problem, iOS 7.0.2 has ended up being the savior. Shortly after the release of iOS 7 many people reported two bugs in relation to the lock screen were reported. One of the bugs allowed a call to be made from a locked phone. Using the emergency dial, the user was able to enter a non-emergency number, and after pressing the call button for a few times the call was connected. Considering the potential dangers in today’s world, this flaw could have been harmful. The other bug allowed stranger or interfering people to access their personal data by dodging the new control center. With just a few moves, they were able to gain entrance to the phone and look through their phones, messages or whatsoever personal information was present. These bugs have been fixed with the advent of iOS 7.0.2, thus you no Longer need to worry about anyone intruding into your personal space. 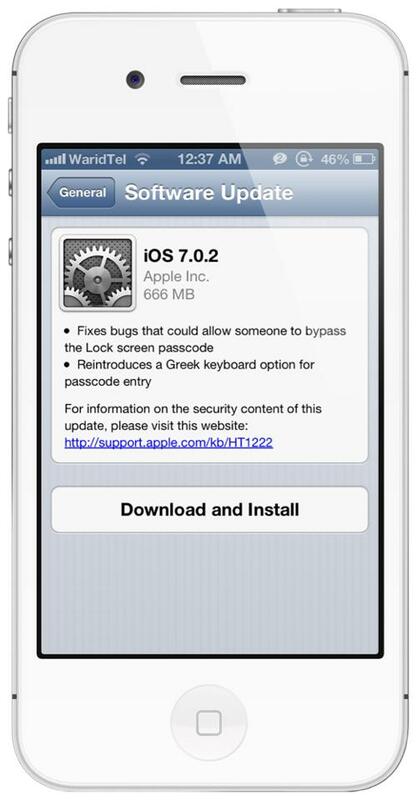 Downloading of the iOS 7.0.2 is available now!